Landon Homes is pleased to announce that we are now pre-selling new homes in Allen TX in the newly opened Pecan Meadow community. Pecan Meadow is located in the City of Allen off Hedgcoxe and Custer Roads. The community will have 120 homesites surrounded by established neighborhoods and mature landscaping. City amenities are close at hand along with restaurants, retail and service businesses. Pecan Meadow includes open spaces and views of a nearby pond. Residents will appreciate the convenience of shopping and dining at Watters Creek or The Village. Pecan Meadow is situated in the highly regarded Plano ISD. Students will attend Beverly Elementary, Hendrick Middle School, Clark High School and Plano Senior High. Area attractions offer a variety of options for enjoying a day off. Visitors to the Heard Natural Science Museum can see dinosaurs roaming the forest and learn about nature. Other options include touring the famous Southfork Ranch, relaxing or playing ball at Celebration Park, and taking a walk on the Bluebonnet Trail. The region offers numerous resources for swimming, disc golf, wakeboarding, bowling, golf, fishing, camping, hiking, biking and much more. Landon Homes has 8 floor plans available to build in Pecan Meadow. Homes have 3-6 bedrooms and range from approximately 2,000-3,000 square feet. Buyers can select alternative configurations to adjust the number of bedrooms or choose upgraded options. Homes start at around $400,000. The 4850 Riverside Collection floor plan is 2835 square feet and is a two story home with 4-5 bedrooms, 2-4 baths and 1 half bath. Plan features include a large storage area at the back of the garage, a formal dining room and a master bath with large U-shaped double-sink vanity. The second floor has 3 bedrooms, a game room with arched overlooks to foyer and full bath with dressing area. This gracious home has high ceilings, floor to ceiling windows in the family room and a beautiful spiral staircase. Vaulted and angled ceilings provide visual interest, while an arched display niche in the foyer offers the perfect place to display artwork. Several elevations are available, each with attractive masonry detailing. 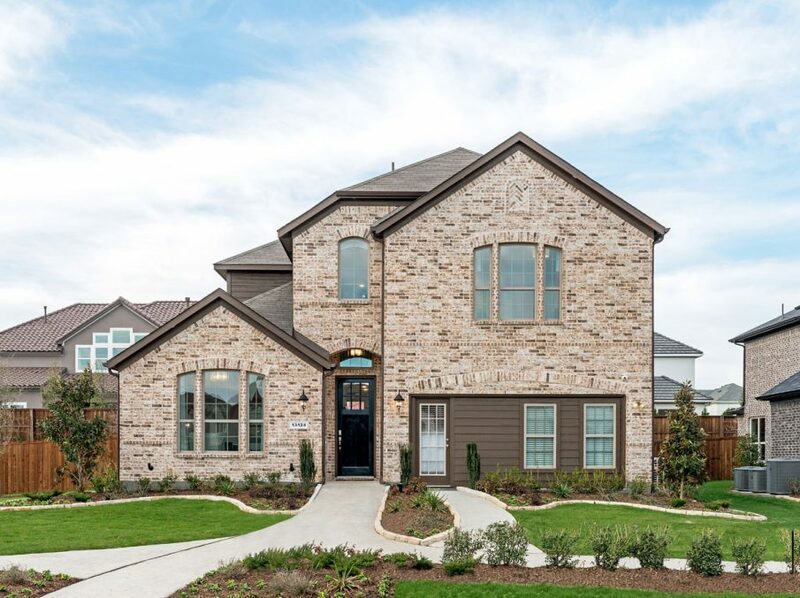 Landon Homes is currently pre-selling homes in Pecan Meadow by appointment only. Call us today at 866-898-3603 to make an appointment to plan your new home in the Pecan Meadows community of new homes in Allen TX.